The Tomb of Ramses VI is one of the most striking and architecturally interesting tombs within the Valley of the Kings, which is situated on the west bank of the Nile in Luxor. Originally built for Ramses V and expanded upon by Ramses VI during the 20th dynasty, its decoration is one of the most sophisticated and complete of the royal tombs. In general, the Tomb of Ramses’ elaborate decoration depicts the story of the origins of heaven and earth, including the creation of the sun and life itself. Extracts from the Book of Gates and the Book of Caverns adorn the entrance corridor, and these continue into the midsection of the tomb, with the addition of the Book of the Heavens. The tomb’s most notable and striking feature is the stunning vaulted ceiling in the main burial chamber featuring a double image of the Goddess Nut swallowing the sun. This is said to represent the endless cycle of life and the revival of the souls of the dead pharaohs. To reach the Valley of the Kings, take a taxi and ask for “wadi al-muluk” for the East Valley and “wadi al-gurub” for the West Valley. No photography is permitted inside the tombs. The ancient marvels of Luxor occupy both sides of the Nile River and this private full-day tour explores both the East and West Bank in one day. Enjoy the undivided attention of a private Egyptologist guide as you visit the UNESCO-listed temples of Karnak and Luxor, and see attractions including the Valley of the Kings, Queen Hatshepsut's Temple, and the Colossi of Memnon. See the iconic monuments of Luxor’s West Bank on a private, half-day tour to the Valley of the Kings, the Temple of Queen Hatshepsut and the Colossi of Memnon. Learn the stories behind the sites as you explore with an Egyptologist guide and visit the elaborate tombs of the ancient Pharaohs. Discover shady arcades and beautifully-preserved bas-reliefs at Hatshepsut’s temple, then stand beside the enormous Colossi that have guarded Amenhotep III’s burial site for 3400 years. Devote yourself to the treasures and tombs of Luxor’s West Bank on this 6-hour guided tour. Instead of spreading your sightseeing too wide, the tour concentrates on the West Bank's three main wonders, with an Egyptologist guide to bring them to vivid life. 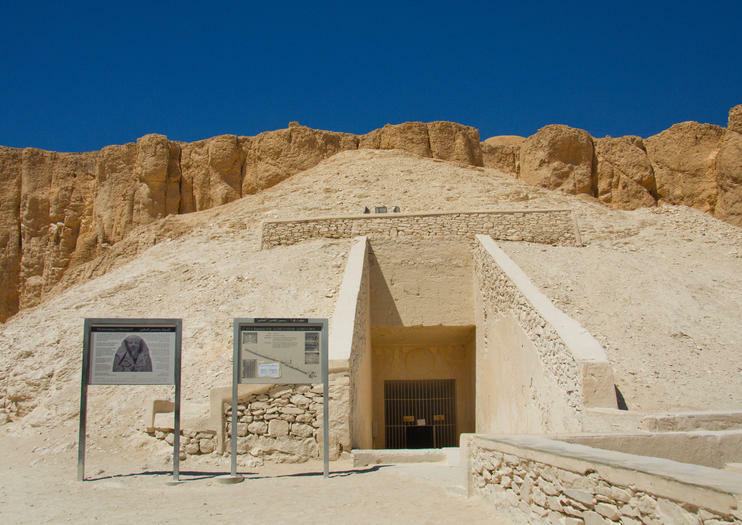 Discover the painted corridors and chambers of three tombs at the Valley of the Kings; and roam the stunning, cliff-cut terraces of the Temple of Hatshepsut, Egypt’s first female pharaoh. Finally, stop to see the gigantic Colossi of Memnon, the last remains of Pharaoh Amenhotep’s mortuary temple.